The Danfoss PX - F Series self regulating parallel circuit heating cables provide the solution to basic freeze protection applications; including pipe freeze and tank freeze protection and roof and gutter deicing. Ensures maximum energy efficiency by producing heat only when and where it is needed. 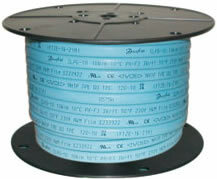 Danfoss PX-F Self Regulating Pipe Freeze Protection Cable - 088L1516 - 120 volt; 8 watts / ft; 250 ft.